(Nanowerk Spotlight) While the first reported fullerenes and nanotube structures were composed of carbon, it was soon recognized that a plethora of comparable inorganic candidates should also exist. A rich assortment of IF (inorganic fullerene-like structures, or IF for short) nanostructures have been synthesized, and are finding practical uses in tribology, photonics, batteries, and catalysis. On such inorganic molecule that can achieve fullerene-like nanostructures, cesium oxide, is particularly useful for a multitude of applications in photoemissive systems. Unfortunately, it is extremely reactive in the ambient atmosphere, so its production and handling require high vacuum and very pure inert conditions; which translates into problematic and expensive manufacturing and handling, which in turn limits its technological scope and device lifetime. In their quest for a relatively uncomplicated high-yield synthesis method for chemically stable cesium oxide IFs, scientists succeeded in exploiting highly concentrated solar radiation (ultrabright incoherent light) toward that end. This resulted in a simple, inexpensive, and reproducible photothermal procedure for synthesizing IF nanoparticles. Motivated by the paucity of any successful experimental techniques for producing more than a few molecules of fullerene-like cesium oxide – a form of the compound that has the potential to be of immense value in the photonics industry for photo-emissive and photo-detection devices – a group of Israeli and German scientists demonstrated that highly concentrated sunlight (solar ablation) is a successful synthetic method and orders of magnitude less expensive than exorbitant lasers. "Nanofilms of cesium oxide IFs (IF-Cs2O) will be particularly useful for a multitude of applications in photoemissive systems, for example, photocathodes, negative-electron-affinity devices, image intensifiers, discharge lamps, television cameras, lasers, and catalytic converters" Professor Jeffrey M. Gordon from the Department of Solar Energy and Environmental Physics at Ben-Gurion University of the Negev in Israel explains to Nanowerk. "Unfortunately, the synthesis of chemically stable IF-Cs2O nanoparticles so far was only possible with a very expensive laser ablation technique. Our team now managed, for the first time, to produce inorganic nanomaterials of this genre with solar energy; or with any non-laser technique for that matter." Gordon collaborated with scientists from other departments at Ben-Gurion, the Weizman Institute of Science, also in Israel, and the Max Planck Institute for Solid State Research in Germany. The team's findings are reported in a recent paper in Advanced Materials ("Synthesis of Fullerene-like Cs2O Nanoparticles by Concentrated Sunlight"). The solar-driven synthesis of IF-Cs2O was performed directly in evacuated quartz ampoules that contained 3R-Cs2O (the 3R denotes a unit cell composed of three molecular layers with rhombohedral symmetry) crystallites, under continuous irradiation with a concentrated solar power of 2.0–7.7 Watts and periods ranging from 30 to 840 seconds. 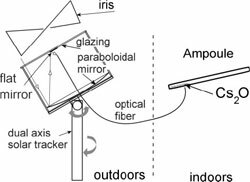 A transmissive optical fiber channeled high-flux sunlight from an outdoor minidish concentrator to the indoor lab bench. Experimenting with various setups, the successful irradiation strategy involved illuminating the quartz ampoules containing the 3R-Cs2O precursor at a fixed location (i.e., a given distance from the ampoule tip). In some instances the ampoule was static, and in others the ampoule was manually rotated about its long axis in order to expose as much material as possible at a set position to the concentrated sunlight. "This configuration appears to produce the degree of evaporation, annealing, and temperature gradient conducive to the formation of IF-Cs2O material and its deposition in the colder unilluminated regions of the ampoule, provided the input solar power is ≥ 6 W" says Gordon. "There was no sizable difference in the quality or quantity of the IF-Cs2O nanoparticles as a function of exposure time." 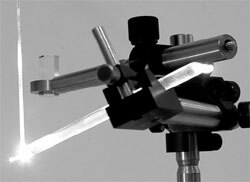 Gordon and his colleagues are now interested in developing the solar ablation procedure to increase yields by orders of magnitude and hence render this technique commercially viable. "Also, we are still trying to synthesize cesium oxide nanotubes, which have never been achieved and would possess outstandingly attractive physical properties too" he says.